Like Henry Jenkins wrote migratory cues are “blurring the line between marketing and entertainment.” At first, people can think it is just a way to “create a more expansive and immersive sosttory” and of course it is. House of Cards is a Netflix original series that is breaking new ground when it comes to original series and how they can be made. House of Cards, produced by Netflix, films an entire season and then releases it all at once, allowing viewers the opportunity to consume a season as quickly as they would like. In my blog post I will be focusing on the main character, Frank Underwood’s, twitter account. Frank Underwood has a following of a little more than 40,000 people. By creating a twitter account for a fictional character through social media the show is using migratory clues to its advantage. Mainly this account tweets direct quotes from Frank Underwood on the show, specifically key moments in episodes, which change the overall outcome of the show. This leads viewers to backtrack and think about re-evaluating an episode that they have already seen, with this new insight, and focus more directly on a scene that is tweeted and quoted. House of Cards and its marketing team do a great job of using cultural attractor and cultural activators to their advantage to expand their fan base and connect fans to each other. A cultural attractor is something that can connect groups of people who share the same interest, like House of Cards. Fans can re-tweet quotes and also post directly on Frank Underwood’s twitter account. A cultural activator’s main purpose is to allow the following of a transmedia object something to do. 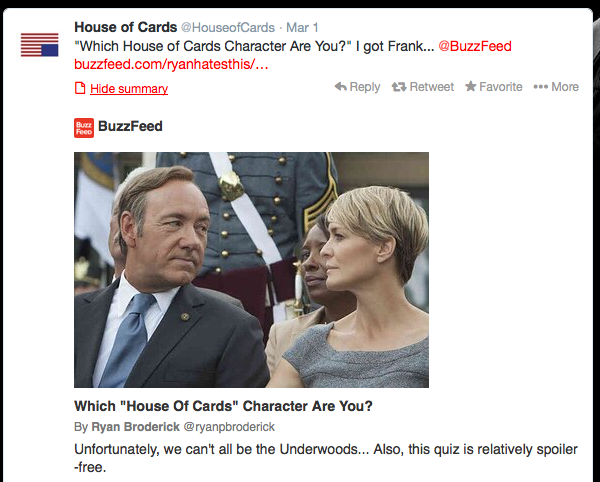 For example, Frank tweeted recently a link for a survey, where you could find out which House of Cards you are most like. This allows fans to really feel like they are on the journey with their favorite characters. Also he tweets very significant quotes from the season, which provide insight to the outcome of the show. Making the fans who follow this account feel like they are on the inside scoop and more knowledgeable than someone who does not follow the account. Jenkins, Henry. “Transmedia Storytelling 101.” Confessions of an AcaFan. N.p., 22 Mar. 2007. Web. 27 Feb. 2014. <http://henryjenkins.org/2007/03/transmedia_storytelling_101.html>. Murray, Janet H. “Chapter 2: Harbingers of the Holodeck.” Hamlet on the Holodeck. New York: Free, A Division of Simon and Schuster, 1997. 27-64.